Alright enough with the pleasantries and let's get down to business. 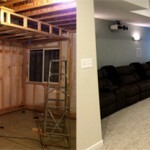 You're here for one reason, to learn how to finish your basement on your own. Why? To save an incredible amount of money! Do you know what you're doing? Heck no! Neither did I, but I've been through the ringer so to speak and this site is a chronicling of the most rewarding project I've ever completed, finishing a basement. If you did what I did, initially you spent hours scouring the web looking for a great site that had all the info you needed. Let me save you the trouble... look no further! 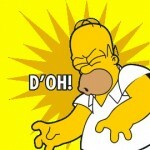 I almost pulled my hair out trying to keep all the information I had found - videos, tutorials, pictures - organized. It's nearly impossible and quite frustrating. 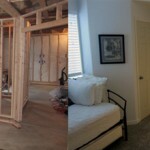 This website has all the information you'll need, a step-by-step guide to finishing a basement while saving a ton of money along the way. If you're up for it, I'll be updating the site with other random DIY projects I'm tackling so feel free check out my posts. Now let's light this candle. For each area of my basement finishing projects I’ve created some start-to-finish posts. Each of these posts lay out the steps I took in each specific area and how they ended up. Hopefully these offer some basement design ideas of your own, but also show you what you can get done when you put your mind to it! 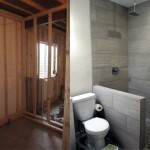 Check out my basement bathroom finishing forum if you have additional questions as well! In my step-by-step guide for finishing a basement, I came across one big challenge during each step of my basement finishing guide that I’m going to highlight in one post each. 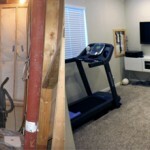 Hopefully by reading these you’ll be able to overcome some challenges of your own while finishing your basement, but you’ll be able to avoid the big mistakes I made.